Recently, I received 2 emails from my distressed readers who fell prey to Dream Catcher scam. They were promised to make $4250 per day with a trading software, but lost all of their deposits within 24 hours. If you plan to fund your trading account, make sure you read this Dream Catcher review first. Save yourself from a financial headache and learn to avoid future scams. Can you tell when you spot a scam online? There are thousands of different scams on the internet, and Dream Catcher is most likely not the first one you have came across. Firstly, Matthew used an obvious lie to lure you into listening to his sales pitch. He promises to make you $4250 just by taking part in a survey, and he got the attention of many curious internet users. However, if you follow the presentation to the very end, you’ll realize that there is no survey to be taken, and no rewards to be claimed. You are simply led to sign up and fund a binary options trading account. Unfortunately, once the money is lost, it cannot be recovered because it’s lost to the market. I’ll go into more details about how the software steals your hard-earned money, but first I have some evidence to show that Dream Catcher is a scam. How did Dream Catcher trade on a Sunday? Anyone who has traded binary options before would know that the market is closed on the weekends, much like the stocks exchange and Forex market. In other words, no one can trade binary options on Saturday and Sundays. This review was written on a Sunday (2 Oct 2016). I realized that the “Live Trades” table of Dream Catcher was still updating their real-time profits rapidly. Apparently, there are no real trades and profits behind the numbers! This is just a computer-generated table used to deceive victims into thinking that the software really works. It uses the date and time from your computer and pair up random profits to appear legitimate. You can try this method if you want to authenticate for yourself. 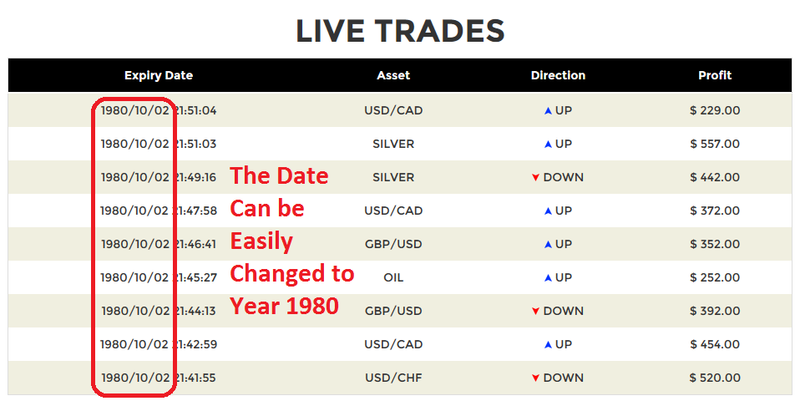 Just change your computer’s date to something different and watch the “Live Trades” table adjusts itself. One of my readers told me that he scoffed at the sales video for promising $4250 per day just by using an automated trading software. However, the “Live Trades” somehow convinced him into convert to a paying victim for the scam. Don’t be the next victim to fall for this unscrupulous tactic. As soon as you open a new trading account, you will be brought to a demonstration page where Matthew claims to make free profits for you, real-time. He said that he deposited $50 into your trading account and generate live trades so you can witness the power of the software. He went as far as to promise you that the profits are all yours. After the demonstration, all victims who signed up to Dream Catcher scam are invariably brought to the real trading page, where they need to fund at least $250 to get started. Despite the $88 “free profits” that Matthew has generated for you just moments ago, your account now stands at a grand total of $0. What happened to that $88? The truth is, that was a fake demonstration. Matthew did not deposit $50 for you, and no trade has been executed. The $88 account balance simply does not exist. Not only that, the broker’s name is completely different, too. In the demonstration, the broker will always be BDB (Banc de Binary). But in the real account, your broker will likely be different. For example, I was assigned to “Option.fm” broker. Never once did Matthew speak of the risks that comes with automated binary trading software within the sales material of Dream Catcher scam. You are led to believe that the software is guaranteed to generate $4250 for you, day after day. However, the truth is hidden in the disclaimer document, much like the hidden terms and conditions in bad products. The disclaimer above was taken from my broker’s account, but it applies to all softwares that trade binary options, Dream Catcher included. Trading in binary options is very speculative and highly risky… only for those investors who… are financially able to assume the loss of their entire investments. Only for those investors who… have the knowledge to understand binary options trading and the underlying assets and markets. Trading binary options is extremely risky, and it is only for investors who can stomach the loss of their entire investments. Despite promoting the software as fully automated and no experience needed, somehow it is only suitable for investors who have the knowledge to understand binary trading and its underlying assets. Evidently, the guarantees given in the sales material and the so-called “Live Trades” are fake and cannot be trusted. In fact, trading binary options is so risky that Forbes warned us against gambling with binary options. If you decide to sign up for Dream Catcher app, you will be required to open a new broker account with their partner brokers, which are unregulated by monetary authorities. The losses are pocketed by the broker, which is then shared with its partner-in-crime – the scammers behind Dream Catcher system. DREAM CATCHER IS A SCAM. I strongly advise you to stay away from the scam if you don’t want to lose your hard-earned money. Instant Cash Club Scam Review – Don’t Be The Next Victim! Thank god I saw this review before funding. I was wondering where that $88 profits went!